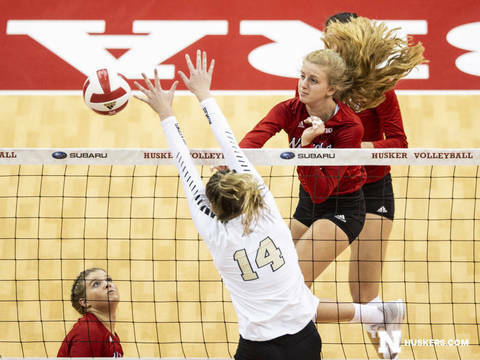 The fifth-ranked Nebraska volleyball team dominated Wake Forest, 25-14, 25-11, 25-9, on Friday night in front of a crowd of 8,067 at the Ameritas Players Challenge at the Bob Devaney Sports Center. Jazz Sweet had 11 kills on an error-free night as she finished with a .579 hitting percentage to lead the Huskers to a .341 hitting percentage as a team. Lauren Stivrins had eight kills on .700 hitting and added three blocks, as NU dominated the blocks category, 8-1. Nebraska (3-1) never trailed in the match, holding Wake Forest to -.033 hitting on the night. Callie Schwarzenbach had a match-high five blocks with five kills, while Sweet added three blocks to her 11 kills. Mikaela Foecke chipped in five kills, seven digs and a season-high four aces. Sami Slaughter added five kills and five digs. Kenzie Maloney had 12 digs, and setter Nicklin Hames had 11 digs along with 26 assists and three service aces. The Huskers more than doubled up the Demon Deacons in kills (37-18) and had an 8-0 advantage in service aces. NU also out-dug Wake Forest, 43-36. Caroline Rassenfoss had six kills for the Demon Deacons (0-5). Set 1: The Huskers bolted to a 5-1 lead with kills by Foecke and Sweet and an ace serve by Foecke. Stivrins connected on three kills to make it 10-6 Huskers, and NU pulled ahead 18-8 at the media timeout after Hames served a 7-0 Husker run. The Huskers finished off the 25-14 win on a Megan Miller ace. Set 2: A kill and block by Schwarzenbach got the Huskers off on the right foot as they took a 3-0 lead. The advantage ballooned to 10-2 after the Huskers went on a 6-0 run on Maloney’s serve. A pair of blocks and a kill by Schwarzenbach, as well as an ace by Foecke, increased the Huskers’ lead to 21-8 on their way to the 25-11 win. The Huskers stifled the Demon Deacons in set two, holding them to -.143 hitting. Set 3: Nebraska’s hot starts continued as it took a 9-1 lead with Hames serving the first five points, which included two kills by Sweet. Mari Kurkova checked in at setter midway through the set and assisted on a Schwarzenbach kill. The Huskers pulled away while rotating in players off the bench. NU finished off the sweep with a 25-9 win. Up Next: The Huskers finish the Ameritas Players Challenge on Saturday at 2 p.m. against Santa Clara, who went 2-0 on Friday with a sweep of Ohio and a 3-1 win over Wake Forest.